As long as your deed restrictions don’t prohibit poultry, you can have fun maintaining a reasonably sized chicken flock in a comfortable suburban backyard or on a little farm. You can expect a steady supply of fresh eggs by keeping your laying hens healthy, with or without a rooster. But if you want chicken meat as well, eventually your inventory will dwindle, and you will need a rooster to fertilize the eggs and replenish your meat breeds. Overall, the eating habits of roosters and hens are identical. Good laying and meat fowl are born, not made -- they either received those good genes or they didn’t. However, even genetically superior specimens' long-term potential depends on you. Poultry need constant access to water at all times so they will eat the amount of the food they need. The less water they drink, the less food they’ll eat. You’ll have more eggs and better quality meat when your flock eats enough of what’s good for them, so buy a nutritionally balanced chicken feed and make sure they eat what they need by giving them fresh, clean water. Change it multiple times a day if they foul it. Your roosters and chickens need carbohydrates, protein, fats, vitamins and minerals. Laying hens need more calcium than meat chickens and roosters do. 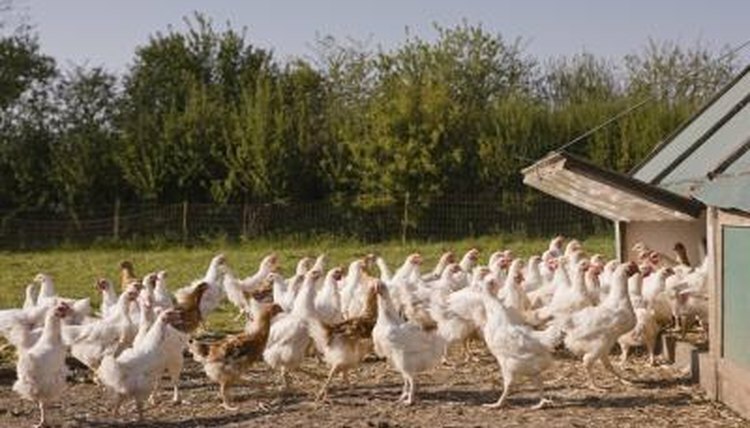 The best way to ensure they get the necessary nutrients is to purchase ready-made grain or meal that is nutritionally balanced for your particular type of poultry. One neat poultry eating habit is that they stop eating when they've eaten the amount of food they need. You can fill their trough feeder; if the contents are quickly gone, add more next time. If is a large quantity left, try reducing the amount. Don’t allow the food to become stale or moldy, or it could cause health problems. Poultry love to forage around in the dirt, plucking up delectable insects, grasses, dirt, pebbles and even the occasional rodent. This is an inherent habit but doesn’t offer them much in the way of necessary nutrition. You can spread commercially prepared mixes of “scratch” to further encourage foraging for exercise and to keep their nails trimmed. Overall, it’s a healthy habit. Many poultry owners like to throw their poultry table scraps, such as lettuce and other fruits and vegetables. There’s nothing wrong with this as long as it’s kept to a minimum so you don’t upset their nutritional balance. Also make sure the scraps are fresh -- don’t use questionable leftovers that you discovered during your annual refrigerator purge. Your rooster’s eating habits mirror those of your chickens, with a few important exceptions: He will search for food for the entire flock, signal for them to eat if the food is suitable, and then stand guard over his hens while they eat. He will join in after they've eaten some first. An aggressive rooster may fight for a larger share, so you may need to separate him. Handling your rooster when he’s a baby chick can help thwart off aggression as he gets older, but it’s not a guaranteed measure. Research various rooster breeds and select one known for gentleness.